Assistive technologies, including ones based on artificial intelligence, can play a major role in shaping how people with disabilities are able to navigate daily tasks. However, what may seem like a good idea to an engineer may not be the reality that occurs when a person with a disability tries to use the technology. University of Texas at Arlington computer scientists and faculty associated with the disability studies minor in the College of Liberal Arts recently were awarded a three-year, $318,778 Research Experiences for Undergraduates grant from the National Science Foundation to create a campus-wide assistive technology program that will teach undergraduate students, especially minority and female students and those with disabilities, how to design assistive technology to help reduce barriers faced by people with disabilities. Ishfaq Ahmad, a professor in the Computer Science and Engineering Department, is the principal investigator. Co-principal investigators are Sarah Rose, associate professor of history and director of the disability studies minor, Julienne Greer, an assistant professor in theatre arts, Manfred Huber, professor of computer science and engineering, and Vassilis Athitsos, associate professor of computer science and engineering. "We're excited about this grant because it will give students research experience while they gain a deeper understanding of the barriers encountered by people with disabilities and the value of universal design, or designing for a wide range of bodies and abilities. With our ties to community resources, participants will receive important feedback about things that will improve lives," Rose said. Many times, assistive technology for people with disabilities is expensive and not actually helpful. Students in this program will gain an understanding of universal design and the need for more practical items that could be helpful in a learning environment, as well as in everyday life. 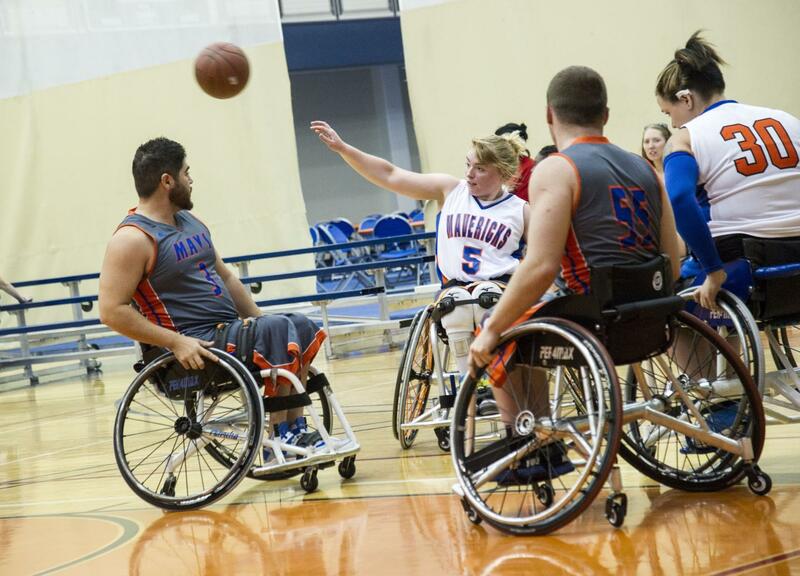 For example, the sports wheelchairs used by wheelchair basketball teams like UTA's national champion Movin' Mavs and Lady Movin' Mavs cost between $3,000 and $5,000. That cost prevents most school districts from offering a wheelchair sport to their students with disabilities, but if assistive technologies could provide a less-expensive alternative, those students would be more likely to be able to play adapted sports. Another example is an exoskeleton intended to help a person with a spinal cord injury walk, but at a cost far beyond that feasible for most people. The grant will bring eight students per year to UTA's campus for a 10-week summer session in which they will learn research skills and basic disability studies concepts and work on assistive technologies. Two of those students will come from UTA, and the program will emphasize traditionally underrepresented populations, such as women, people of color and those with disabilities. The students will pick research projects in areas such as converting American Sign Language to speech, human-machine interactions, and making digital humanities accessible via the Texas Disability History Collection at the UTA Libraries. They will learn how to perform research and gain context about people with disabilities, partly from people with disabilities. UTA is one of the nation's leading institutions in helping students with disabilities gain access to educational opportunities. The University was home to one of the country's first organizations for students with disabilities and was the first university in the United States to offer full scholarships for athletes in adapted sports. Rose directs UTA's disability studies minor, the first such program in the south and one of only about 30 in the nation. Rose currently is advising institutions such as Yale University and UT Austin as they consider establishing similar programs. Currently, 70 students from more than 20 departments and majors are completing the minor. Elisabeth Cawthon, dean of UTA's College of Liberal Arts, said, "This grant will enable us to further strengthen our work with and research in assistive technologies and disability studies. The knowledge gained through this collaborative effort will benefit not only the faculty, but the students and people with disabilities as well. With greater interaction and communication about peoples' needs and how technology can respond to those needs, UTA will cement its status as a national leader in this area." Fillia Makedon, professor of computer science and engineering, and Athitsos are developing iWork, a smart, robot-based system that assesses workers' physical, cognitive and collaborative skills while they perform simulated manufacturing tasks with an emphasis on finding the best ways to train and prepare workers, both with and without disabilities, for the industry of the future, where a worker has to safely and efficiently collaborate with advanced robots. The pair also is working with Yale University to use artificial intelligence to help experts assess learning difficulties such as ADHD in children very early in their lives. Previously, Athitsos earned a National Science Foundation Early Career Grant to further develop a computer recognition system that will become a visual dictionary for American Sign Language. Greer has used her experience and research to help scientists and engineers better understand the human experience so that they can build more responsive robots. She is also working to find out how robots can be integrated into the home to provide physical and emotional support. Huber designed a reservation/reminder software system as part of a project that eventually will transport veterans on military bases to doctors' appointments using driverless cars. He, with Gergely Zaruba, computer science and engineering professor, Carolyn Cason, former dean of the College of Nursing and Health Innovation, Kathryn Daniel, an associate professor of nursing, and David Levine, computer science and engineering senior lecturer, created a "Smart Care" apartment infused with intelligent care technology designed to reduce risks encountered by older adults and those with disabilities who want to live independently in their own homes. The interdisciplinary nature of the grant is an example of how different academic units are supporting health and the human condition, a theme of UTA's Strategic Plan 2020: Bold Solutions | Global Impact, said Duane Dimos, the University's vice president for research. " UTA continues to be a leader in assistive technologies, and this grant will enable our engineering faculty to work closely with faculty from across campus to offer a curriculum that is global in its scope and helpful to aspiring engineers and those with disabilities alike," Dimos said. "In addition, the strong relationships with campus and community groups that Sarah Rose has cultivated will enable program participants to have feedback in real time about their efforts, which will lead to a better final product."